After you merge multiple PDF files in to one, you may feel difficult to find out the page you want exactly. Then do you want to renumber the page in order to get the page you need quickly and easily? In this case, we recommend you PDF Numbering Tool (A-PDF Page Number Pro) to have a try. With PDF Numbering tool, on one hand, it provides a super easy way for users to number the page by several clicks; on the other hand, you are able to change the page number position as you want. Anyway, PDF numbering tool is a wonderful PDF tool to add page number for PDF files easily. 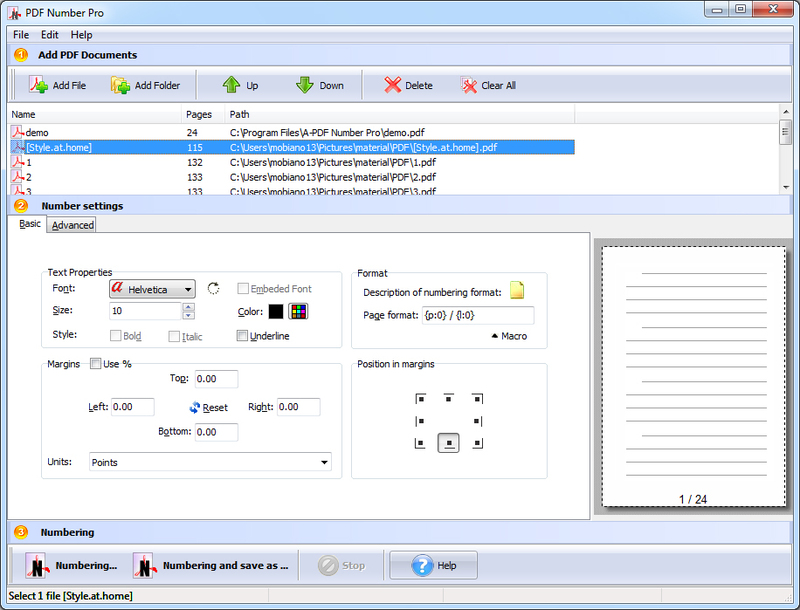 With PDF Numbering tool, users can insert page number with ease. First of all, you should import PDF. By the way, you can change the order of imported PDF files by moving up and down. What's more, it is easy to delete the PDF file you don't want. There are basic settings and advanced settings of PDF Numbering tool. Let's start with basic settings. Basic settings are including text properties (font, size and style), margins, format and position in margins. And then advanced settings is for selecting number type, page ranges, page number start and end, text effect and backup. Anyway, it is easy to select and simple to make it work. After that click "Numbering" or "Numbering and save as" to add number for PDF pages. Compared with the traditional PDF tool, it is affordable to use. On one hand, it spends little and plays an important role in work and study; on the other hand, it will save much time for you to add page number on PDF page in a quick and correct way.